Greetings, adventurer! 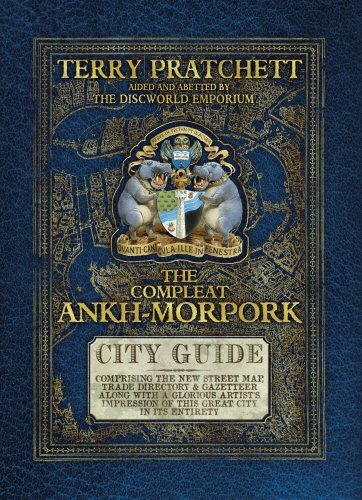 We lay before you this most comprehensive gazetteer encompassing all the streets of Ankh-Morpork, as well as information on its principal businesses, hotels, taverns, inns, and places of entertainment and refreshment, enhanced by the all-new and compleat map of our great city state. Our city has grown well beyond its ancient walls, but the remit of this commission from the honourable Guild of Merchants was to 'map the city', the pulsing organ of commerce and culture, the heart as opposed to the body, and this we have done. In spades. We ask that when you pore over this glorious work you spare some thought for the humble cartographers and surveyors who made journeys into the darker corners of our metropolis - no less dangerous than the wilds of Skund or Bhangbhangduc. To some the only memorial is the map you now possess. Others, in their quest for knowledge, paid the highest price that scholarship demands, which is to say, a day off in lieu. And so we dedicate this map and these accompanying words to the officers, councilors and members of the Merchants' Guild and to all who will find in its pages paths yet to tread and places yet to explore within the magnificent wonder that is the city of Ankh-Morpork.